The phrase “speaking as a mother” has become something of a meme, and not in a good way. Its authoritative value withered away as it was publicly used to defend statements ranging from the breathtakingly inane to the outright false, and the downright offensive, abusive, and your garden variety rudeness. If we want the phrase to mean anything again, among the first steps needs to be a willingness to speak for all mothers. A solidarity among those women who care for children, in government advocacy, social action, and that most vital field – charity. To offer that solidity here, let’s hear the stories of one group of mothers who have found themselves in some of the most difficult and desperate conditions imaginable – the Burmese Rohingya. A group of around 400,000 people who are fleeing the area of Rakhine state as the Burmese army conducts a campaign that has been widely described as ethnic cleansing. With both a broader understanding of the politics that lead to this situation, we can approach this situation in an informed way, providing support, compassion, and dignity as best we can. Much of the story behind this situation is laid at the feet of one woman. Ang San Suu Kyi. The daughter of the man who founded modern-day Burma, Aung San Suu Kyi’s tireless efforts to drag her country out from military dictatorship, lead to her spending fifteen years under house arrest, separated from her family. In 2010, she was finally given permanent release from house arrest, and in 2016 she took the office of “State Counsellor” – the closest thing Burma has to a Prime Minister – following several elections and much constitutional wrangling. Yet that fact that she isn’t the Prime Minister begins to speak to the bigger problem here. The military dictatorship was not destroyed by Aung San Suu Kyi’s efforts. Rather, a compromise was found, and the authority of the office of “State Counsellor” does not extend to the military. Its easy to see why this would cause problems. Imagine a country where one office controlled everything except the army, but the army could still do whatever it wanted. So then in 2012 when tensions began building between Buddhist Rakhine natives, and the Rohingya Muslim minority, the army stepped in to defend the people it considered closer to them – and the minority Rohingya suffered. This escalated further and further, until the army was driving out entire villages, forcing them to flee eastwards, over the border with Bangladesh. In all this time, Ang San Suu Kyi has remained silent. She may have several good reasons. To speak against the army would invite them to retaliate against her, possibly putting her back into house arrest and potentially undermining the efforts she has made to make Burma more free and more democratic. She is also weary of disrupting her relationship with China, who have also heavily invested in her country, and have their own history of dealing harshly with Muslim minorities. But the fact is, under her watch, the situation for a group of people in desperate need of her protection has deteriorated rapidly. As the army made its moves across the length and breadth of Rakhine state, families were forced on the run. This was no organised removal or planned relocation. Soldiers arrived. Guns were fired. Families had to flee. Speaking to Al-Jazeera in 2017, twenty-year old Sameron told the story of how she was heavily pregnant when the Burmese military came for her town of Rajarbill. Not having enough time to prepare and gather what they might need for the journey, she and those she travelled with made their way to a village called Itella. It was abandoned, but they were able to scrape together enough food from the empty building to keep them going for about five days. But then the army came again. So they ran. They ran so far that even this food ran out, and at one point they were walking east with no food or water. But this wasn’t just the stress of constant travel without the food and resources to keep going. “I had gone into labour." 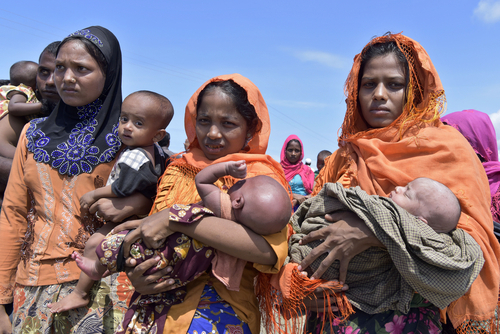 In one of the largest refugee camps in Bangladesh, an area known as Cox’s Bazar, 25% of the children are suffering from malnutrition, and only 22% of the births are happening in the presence of healthcare professionals. Speaking to the Guardian, Rachel Cummings of Save the Children said of the mothers and children among the refugees “From the very beginning they will battle odds stacked against them, living in an overcrowded environment where everyone is desperate for help. There are many different Rohingya affiliated charities out there, working hard to help those in the most difficult situations. Donating to these in whatever way we can is of course absolutely vital. Yet alongside that, being both aware of and trying to understanding the situation, is a big step in the right direction. As we reach out to understand each other, and grow in compassion as we do so, the world becomes a little more friendly, a little closer, and we can be something like family, even when we’re thousands of miles apart.